Well, this isn't at all peculiar. It’s a well-known fact that Jaguar is busy at work on its first SUV. Expected to be based off last year’s C-X17 concept and with a 2016 launch date, Jaguar’s engineering team is reportedly making sure it’ll drive and handle as a proper Jag should. For starters, it’ll be based on the same, although modified, version of the platform that underpins the new XE sport sedan. But a Jaguar official has just stated the new SUV really won’t be an SUV at all. Nor will it be a pure crossover. We should call it a "sport crossover," according to Jaguar Land Rover boss Ralf Speth. "A Jaguar SUV is not possible. SUVs and 4x4s are for Land Rover. The Jaguar concept is far more road-oriented. It will need a different kind of name." For example, BMW conveniently rebranded its SUVs as Sport Activity Vehicles (SAVs). Jaguar also needs to be careful not to allow its new "sport crossover," as they’re describing it for now, to interfere with Land Rover sales, notably the Range Rover Evoque. Basically, don’t expect to see Jag’s next car to have any off-road capabilities. 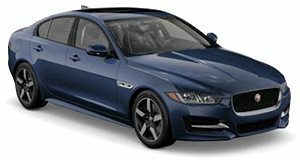 It will literally be an XE with a crossover body and raised ride height.